Shorter Princess sailings are filled with families and couples looking for a quality, midpriced experience; longer cruises draw an older — largely 50s and up — crowd of empty nesters and retirees. On sea days, you’ll find many complimentary classes — which range from computers to glass blowing and pottery painting — and supervised kids’ activities include educational options, such as Science on the Seas (developed with the California Science Center) and yoga for children. Princess appeals to families and couples looking for a quality, midpriced experience; longer sailings draw a mostly 50s+ crowd. Party animals and singles looking to mingle should go elsewhere — with the exception of new, shorter cruises (three- and four-night sailings out of LA, for example) that attract a young crowd. Princess Captains were the first to officially marry couples onboard (due to Bermuda registry), and some ships even have a chapel. Many (often complimentary) classes, which range from computers to pottery, are available. New movie releases are played poolside on LED screens — with free popcorn. Princess offers both traditional (early/late sittings with assigned tables) and modern (eat anytime, anywhere) dining options. 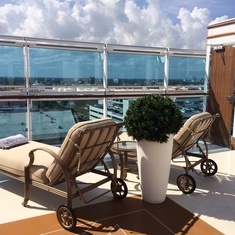 Elegant deck designs include a glass-bottomed “SeaWalk,” which juts out 28 feet beyond the edge of the new Royal Princess, and lovely wraparound teak decks on most other ships. Supervised kids’ activities include lots of learning options, from “Science on the Seas” (developed with the California Science Center) to yoga. Sign up for the behind-the-scenes ship tour ($150 each, chosen via lottery) to see the engine room, bridge, and other off-limits areas. 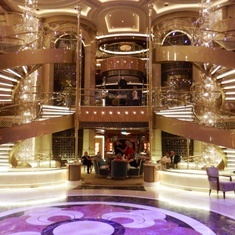 The outdoor swim-against-the-tide lap pool on the Grand-class ships is a cool way to exercise. The tiered cabin design on half of Princess' ships means your upstairs neighbor can look down onto your balcony, putting the kibosh on privacy. There’s a surprising lack of child care for the under-3 crowd. 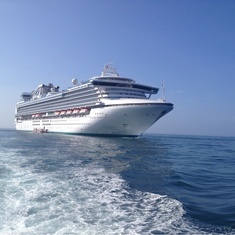 There are currently 221 discussions about Princess Cruises. 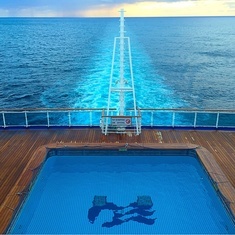 If you choose to follow Princess Cruises you will receive weekly email updates with the latest reviews, tips, and photos from Cruiseline.com members about Princess Cruises.